I would love to see Elliot Yates in the Tournament of Champions, that quasi-sesquiannual showdown of recent top Jeopardy! players. But with the next TOC at least a year away, will he be able to hold on to his position on the leaderboard? That’s the question I set out to answer – or to model, anyway. 1. my assumption was that 4-timer Catherine Hardee had been in the pool for the 2014 TOC, but it appears she is in the current running. 2. the next TOC will air in November 2015, far earlier than I had anticipated. 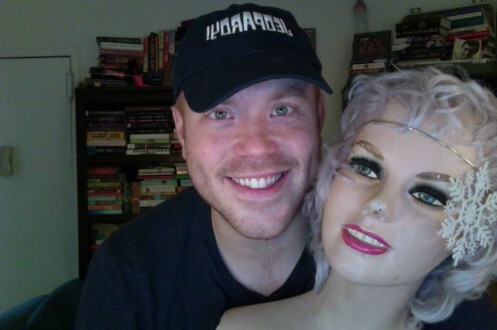 Note: If you want to jump right to my model’s prediction, click here. Who qualifies for the TOC? Here are the stats for the last players in for all TOCs since mine, in 2004. My hunch is the next TOC will be held May 2-13, 2016. That would give 18 months between TOCs, which has been the norm, more or less, over the past ten years. 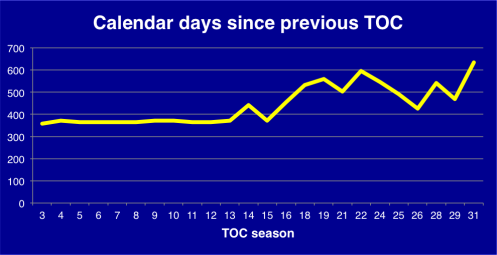 There have been 12 weeks of regular play since the last TOC. Barring any unannounced special events, there are 17 weeks left in Season 31. 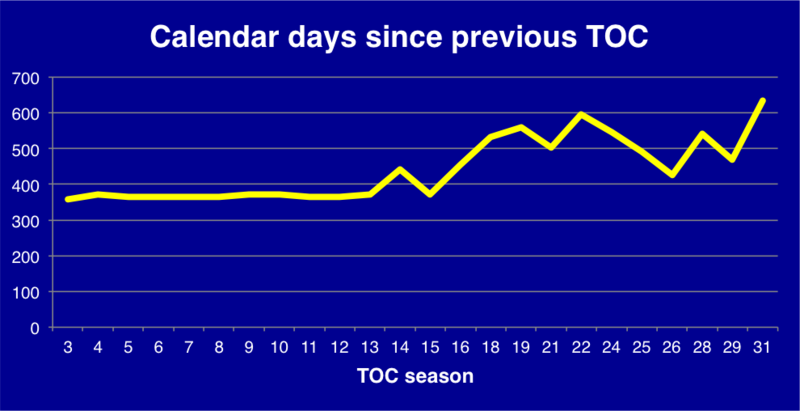 In Season 32, assuming 5 weeks for special events in November and February, there will be 28 weeks before the TOC. That’s a total of 285 games – slightly above average. This is just our count from home, however. The producers can end a qualification period for a particular TOC whenever they want; in fact, my understanding is the last air date to qualify for November’s TOC was October 10, not November 7, the Friday before the TOC. We’re off to a slow start, though. Through 80 games, we have just two 5xers and one 4xer. … and eventual 8xer Ben Ingram had won his first two games. A really, really, really slow start. I’m going to further assume that there will be just 12 spots available, with one berth going to Teachers Tournament champ Jennifer Giles, another to the College Champ later this year, and a third to the winner of another tournament (probably Teachers) in the first half of Season 32. 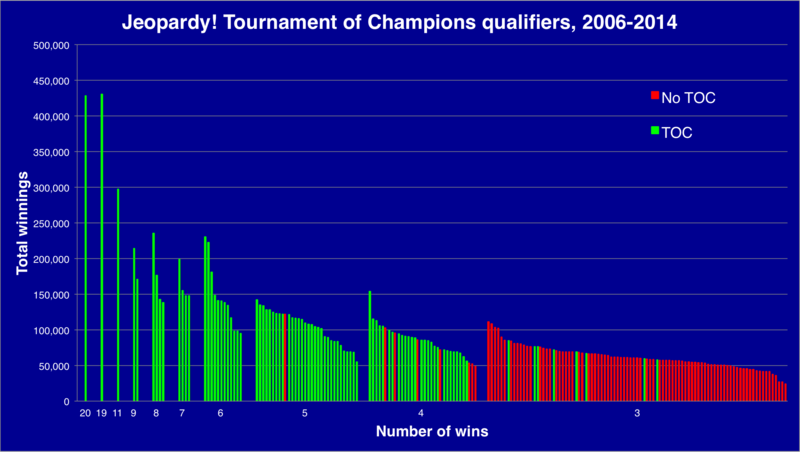 Here are the stats for the twelfth regular qualifier in each of those years. Judging from these stats, it doesn’t look great for Elliot. He would have gotten #12 or better just twice. But this is a new slate, and I’ve got some data from the J! Archive to play with.  I went with a different method: figure out how often a X -time champ wins her next game, then use a random-number generator 225 times to see whether our hypothetical champions remain at the first lectern, or if they’re replaced. Since November 30, 2004, there have been 1,860 games in regular play. Here is the breakdown of how many players have won their X th game, either by win or by tie (R.I.P.). 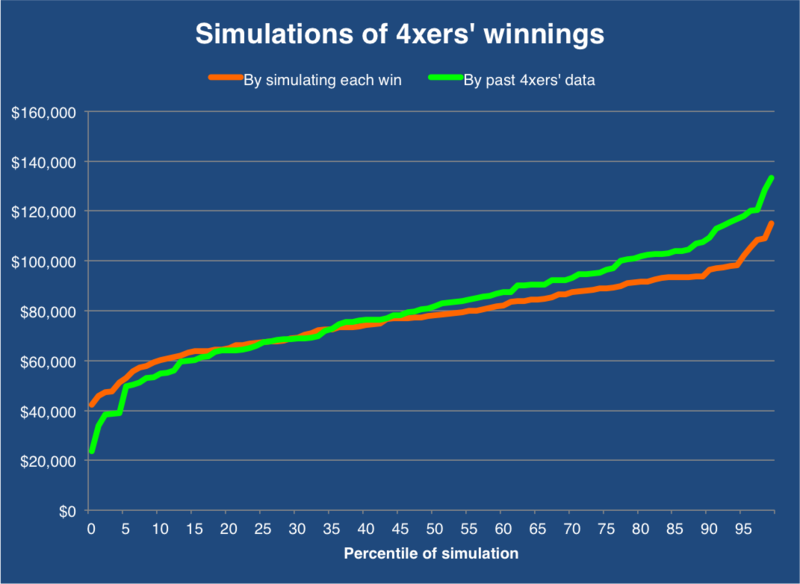 Note that challengers win slightly more than 1/4 of the time; once you’ve got a W under your belt, you can get rolling. Four-time champs also receive a strange boost. The model expects 14 players to have 4 or more wins by the end of the qualification period. I’d take $65,000 any day of the week, but that’s a low total, historically, for 4xers, who average $83,760 over their runs (standard deviation: $21,079).  In simulations with two different approaches, Elliot’s total ended up around the 20th percentile. Only time will tell if Elliot will make it. He was a popular and likable player, though, so maybe they’ll cut the qualification period short if it looks like he’s going to get dropped. They used to have TOCs once a season, right? I’ve noticed that they haven’t had a 3 timer qualify since they went to a roughly 18 month period between tournaments. So the actual count is 305, only eight less than the total prior to the last TOC. But we now know that the model underestimated the count by at least five, as a result of having CJ! in May, vice a standard tournament. If there isn’t any more special play before the end of Season 31, that would add another ten, for a total of 320.